Arthritis is a common, yet painful disease that causes joint inflammation in the body. 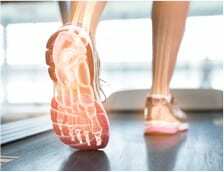 Though it can affect any joint, many people have arthritis of the foot and ankle, where tiny joints are responsible for supporting the body’s weight and absorbing shock. Arthritis causes the joints to swell and become inflamed, leading to severe pain. Often, a person with advanced stages of arthritis will experience sensations of bone rubbing on bone as the cartilage deteriorates and results in bone spurs. there are more than 100 types of arthritis? Many of them can affect the joints of the foot and ankle, causing pain and stiffness. According to the Centers for Disease Control, more than 52 million adults – 1 in 5 – have been diagnosed with some form of arthritis in the U.S. Of them, many suffer from debilitating foot and ankle pain that makes even the simplest everyday tasks like walking or exercising much more complicated. What causes foot and ankle arthritis? A person can develop foot and ankle arthritis as a result of many different causes or ‘triggers’. For example, osteoarthritis is a degenerative disease in which the cartilage surrounding a joint slowly wears down. Injuries can also cause the disease to develop, resulting in posttraumatic arthritis. Another type of arthritis – rheumatoid arthritis – is an autoimmune condition that causes the body’s immune system to attack the tissues of the joint. Though the disease is not believed to run in families, certain people – particularly those who are obese – are at a heightened risk of developing it. What are the symptoms of foot and ankle arthritis? A person with foot and ankle arthritis will have varying degrees of symptoms depending on how advanced the disease is. However, this condition typically causes stiffness and pain when walking or standing, as well as tenderness when pressure is applied to the joints. The joint may also swell or become warm to the touch, and in many cases it is worse in the mornings or when participating in vigorous activity. How will an Orthopaedic Foot and Ankle Surgeon treat foot and ankle arthritis? There are many different ways of treating foot and ankle arthritis. Though there is no cure, the focus is often on symptom management and slowing the progression of the disease. At our office, we emphasize a non-surgical and minimally invasive approach, which may include lifestyle modifications, orthotics and the use of advanced and alternative therapies. For more information about foot and ankle arthritis treatment, contact our office to schedule a consultation. For recalcitrant cases surgery may be indicated, which includes fusion and in some cases, total ankle replacement. Please consult with us for more information.